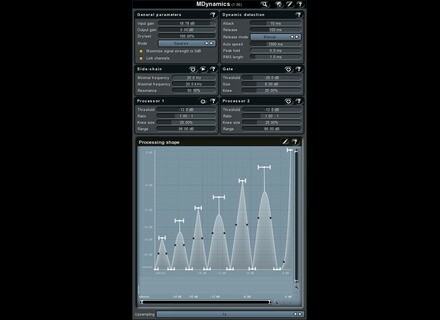 MDynamics, Software compressor from MeldaProduction. 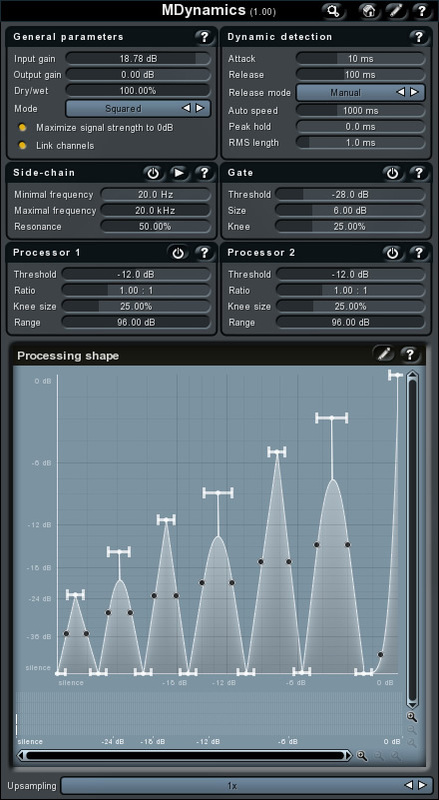 MeldaProduction has released MDynamics, a dynamics processor designed for mastering. However, MeldaProduction assures that due to its very high speed and zero latency it is suitable for any purpose. "Starting with two compressor/expander units and finishing with advanced custom processing shape editing featuring the MeldaProduction Envelope System (MES) technology, MDynamics is a total dynamic processing solution," according to MeldaProduction. Custom processing shape - by enabling this feature MDynamics immediately inherits original processing envelope and you can modify it using our MeldaProduction envelope system (MES) technology, that lets you create any dynamic processing shape you like, according to MP. User interface - You can change values and gain maximal accuracy using textual editing. Smooth visualisation of resulting frequency response with zooming. Parameters are adjustable from the graph with advanced controls. Advanced dynamic detector featuring manual and 4 automatic modes with adjustable limits and speed. Besides standard attack and release parameters MDynamics provides peak/RMS settings and peak hold feature. Actual source level indication inside the shape graph - you know what dynamic value you can actually expect on the input and output, and what gain-reduction MCompressor performs. Adjustable upsampling 1x-16x to minimize aliasing and get clear sound. Signal maximization - compressors lower the signal above threshold. MDynamics can compensate the reduction to ensure that if the source has reached 0dB, the result will too, according to MP. 3 signal shaping modes, dry/wet control and other supportive parameters that ease your work with MDynamics. 64-bit processing and unlimited sampling rate, recommended maximum is 384kHz. MDynamics is said to have low harmonic distortion. Global preset management - using a title button you can save your settings, which are shared on the computer, so you can access them in other songs. Pptimized for SSE and SSE2 processors. MDynamics is available for Windows as a VST effect plug-in. It has an MSRP of €149, but is currently available for the introductory price of €50. More info over at www.meldaproduction.com/. Producing Voiceovers With Logic 8 Grooveboxmusic.com has announced the availability of its Producing Voiceovers with Logic 8 video collection.